The DC Trinity: Batman, Superman, and Wonder Woman. 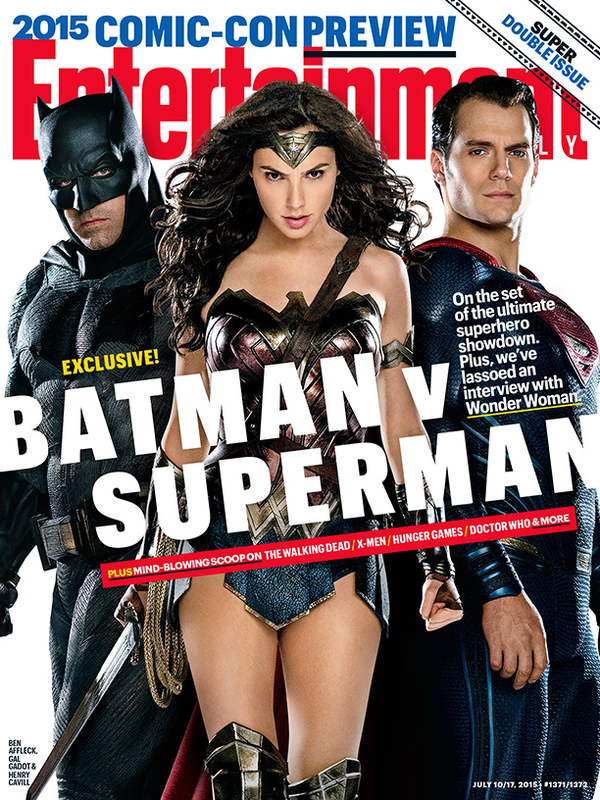 A week before the annual Comic Con convention in San Diego, the latest issue of Entertainment Weekly reveals six brand new images from the upcoming DC Comics film Batman v Superman: Dawn of Justice. The preview issue of highly anticipated new movies and shows includes six brand new images, including a clear shot of Ben Affleck as Batman, a non-filtered photo of Gal Gadot as Wonder Woman and Jesse Eisenberg as Lex Luthor with hair–before going bald, of course. The highly anticipated second entry in DC’s attempt at a shared cinematic have dropped one or two images sprinkled over the past year and a half. Now, in one issue, we get six brand new images (seven if you count the cover). The double issue of EW features the six promotional images, details from the set of the film, and an interview with the new Wonder Woman. We’ve heard a ton of news about the character of Batman, but hardly any details about Wonder Woman’s role in the film, so Gal Gadot’s interview will hopefully shine some light on her character’s cinematic debut. Check out the full gallery of promotional photos on EW.com. Batman v Superman: Dawn of Justice releases March 25, 2016.